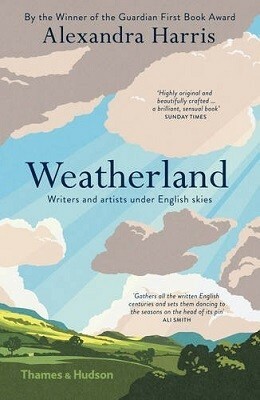 Becalmed in Heathrow after a cancelled flight returning from Portugal this fall, I picked up Alexandra Harris’ Weatherland (2015) to ease the wait. Last night I finished it. Why so long? Well, it was a busy time, and I dipped in and out between work travel and renovations. Frankly, at times like that, nothing other than fiction gets more than a page read at bedtime before oblivion. But I also savoured it. This is not a book to be rushed. It’s a beautifully written liberal arts education in paperback. Later, in the 1700s, the English idealize the Italian landscape, and painters like Richard Wilson tried to capture those moments when the English light matched that of the Mediterranean, like the paintings of Claude Lorrain from the previous century. I loved Harris’ description of the ‘Claude glass’ which was a small mirror carried to help late 18th century tourists get the painterly effect on a dreary day. Comically, users turned their back on the landscape and viewed it in reflection, the light changing toward the sublime thanks to the mirror backing. We cannot look back in anything like superiority given the popularity of the selfie stick. A much travelled colleague has remarked that he has been in places more beautiful than Sable Island, but has seen more beauty there than anywhere else. The expansive seascapes and dunescapes, magnificent yet ‘dreary’ to some 19th century writers, soon force one’s attention to the smaller scale.